We are big believers of "eating your own dog food". So at every opportunity we use Formyoula to help us with our marketing, support and survey efforts. We have recently added a new form element called NPS (Net Promoter Score). NPS surveys are great to get feedback from your customers and understand how they feel about your service. It can reduce churn and build customer engagement. The NPS element can be used for online surveys or mobile offline forms. When used as an online survey the NPS score can be pre-filled from a URL link. This works great, if you include the NPS score buttons in your email templates. Clicking on a button will open the survey and pre-fill the selected score. As you can see in the below example. Customer email snapshot on the left with NPS score buttons. 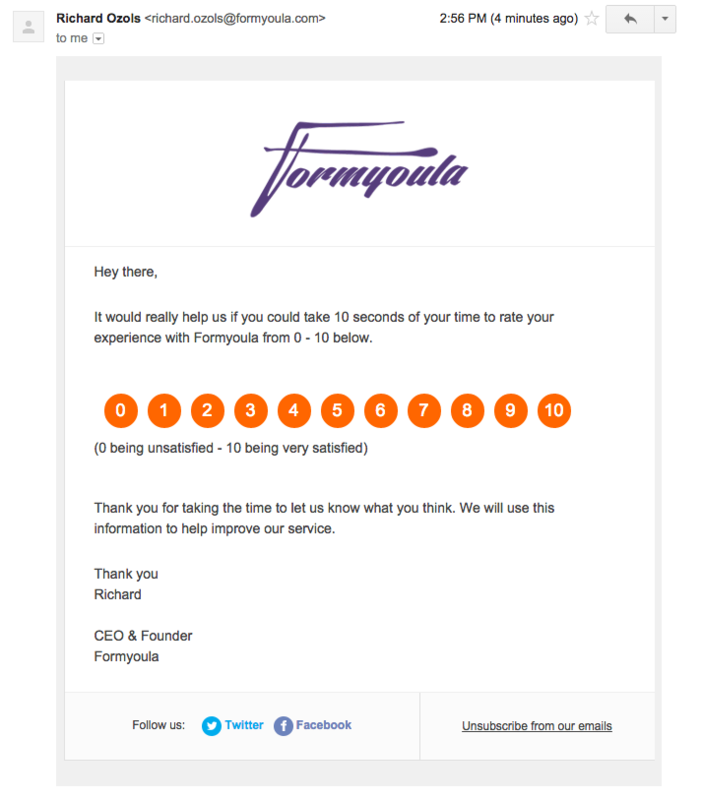 Formyoula survey on the right pre-fills customer choice from the email. We use Salesforce.com as our main CRM and email marketing tool. Custom workflow rules on Salesforce deliver our NPS emails to contacts. 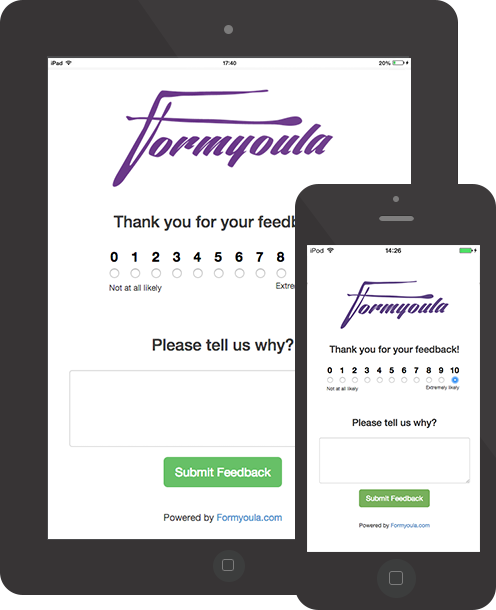 Formyoula captures the survey results and delivers them back to Salesforce. Each response gets recorded and linked back to the contact who participated. This allows us to trigger followup emails based on the NPS score we received. Using Salesforce reports and dashboards we see our NPS rating in real time. The best part is that there is no development required and the setup takes minutes. We have recently started using Intercom.io for In-app communication with our users. Intercom is great for delivering valuable information to our users at the right time. And has helped us to connect with them on a more personal level. Similar to Salesforce, we use Intercom segments to deliver our NPS In-app messages. In-app messages have a button that takes users to the Formyoula NPS survey. We record responses as new events on Intercom. This allows us to trigger followup messages based on the NPS score we receive. To link Formyoula surveys with Intercom we use Zapier.com. Zapier can link more then 300 online services with Formyoula. So you can use tools like MailChimp, Zoho CRM and HubSpot to run Formyoula surveys. This picture illustrates a high level flow how we run NPS surveys with Formyoula. Click to expand the picture. This is one of the email templates we use for our NPS surveys. Each button links back to the Formyoula survey and pre-fills the score. We will share this template in one of our guides. This is one of our In-app messages on Intercom we use for NPS surveys. The button links to a Formyoula survey and feeds the result back into Intercom. Here you can see how the Formyoula NPS survey looks on desktop and mobile browsers. The look and branding can be easy customised with the Formyoula form builder. After submitting the survey, Formyoula redirects users to a thank you page. And records results both on Salesforce and Intercom. The next two screenshots show NPS recorded as a new record on Salesforce and new event on Intercom. Now we can use manual and auto responses based on the captured score and feedback . All results feed into our reports and dashboards. This gives us a real time insight into our user happiness. Thank you for reading and please get in touch if you have any questions about NPS or Formyoula.